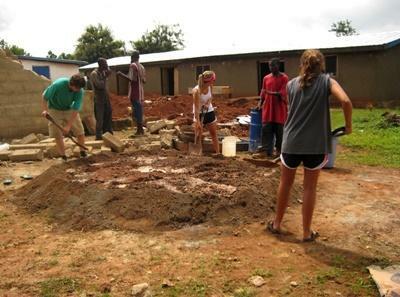 If you’re on a gap year, summer placement, or career break and want to get your hands dirty, our General Building project in Ghana may be right for you. In addition to the basic project, you may also help with landscaping the surrounding area, painting local schools, and renovating classrooms. In the past, volunteers even built a library for Kwamoso village school. This is a great opportunity to get involved in a rural project and become an integral part of the local community. Our full time regional coordinators live nearby and visit the placements regularly, so you'll always have full support from Projects Abroad. Building work takes place early in the morning and late in the afternoon to avoid the hot midday sun, so you'll have plenty of time to get involved in Ghanaian life. Many volunteers immerse themselves in the local community by helping around the kindergarten class or playing football with some of the school children once the building work has finished for the day. Volunteers who join the Building project in the Akuapem Hills may also be interested in spending a few hours a week working on the Agriculture & Farming Project’. If you are interested in this please make a note on your application when you apply.